Royal Caribbean has released version 1.10.2 of its new smart phone app, which prepares to add Brilliance of the Seas to the smartphone app as well as adding the much-anticipated chat feature to Allure of the Seas. The chat feature allows guest-to-guest chat on Allure of the Seas. Guests may link to other staterooms and chat with friends and family for free. 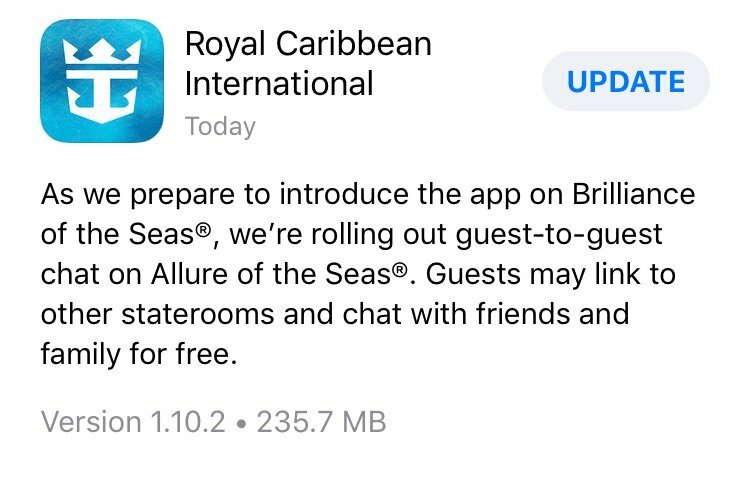 Allure of the Seas is the first Royal Caribbean ship to offer the chat feature and marks a major step forward in the app's development.